When I was young, I enjoyed mazes. There was an immense satisfaction in finding the right path. 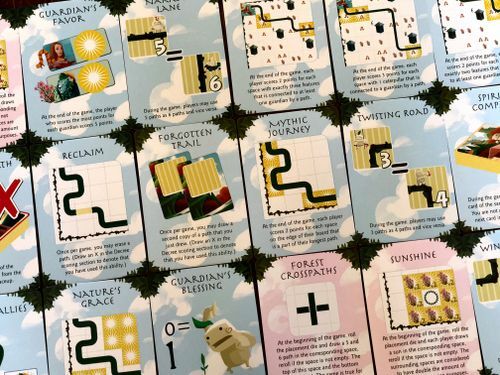 Kokoro: Avenue of the Kodama takes the same pleasure I found in that pastime and creates a lovely, fascinating little game. 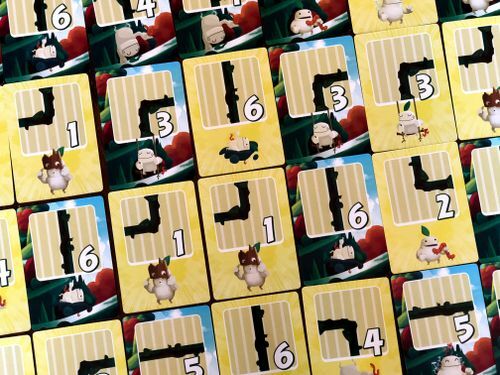 In Kokoro you are connecting shrines to flowers and caterpillars, scoring points for the total that are connected. Each turn a card is revealed with a specific path shape. You can draw that path shape anywhere on your dry-erase player board. Doing so successfully requires much more forward planning than is initially apparent. Not every path shape will neatly connect to a previous path. You could choose not to draw the path shape this turn and instead secretly look at the next shrine. This of course diminishes how many flowers and caterpillars you can connect. A better approach would be anticipating where a path might go, placing the path shape to help in the future. This strategy resembles the mazes of my childhood — seeing how a potential path might twist and turn through the grid. In planning this path, you don't want to block other shrines or isolate high scoring squares. Its not simply a matter of seeing how the path might fill the board. You also must consider the odds that a needed path segment will appear. Nothing is more frustrating than needing a straight path when all the straight paths have been exhausted! You also don't know when the current round will end. Some of the cards have a gold background. Once 4 of these cards are revealed, the current round ends, the sanctuary is scored, and the next sanctuary is revealed. This can easily catch you out with an incomplete path. Balancing long, high scoring paths against the possibility of a short round can be very tricky, especially since each successive round you must score more points than the previous. Fail to beat your last score and you record zero points for the round. This clever scoring twist encourages pushing your luck, constantly trying for that longer and longer path. I really enjoy the spatial planning, card counting, and odds calculation of this game. There are so many little moving parts it is easy to make a simple mistake. And that you and your opponents are doing this simultaneously further adds to the enjoyment. Despite all having the same cards and same objectives, each path can be radically different. 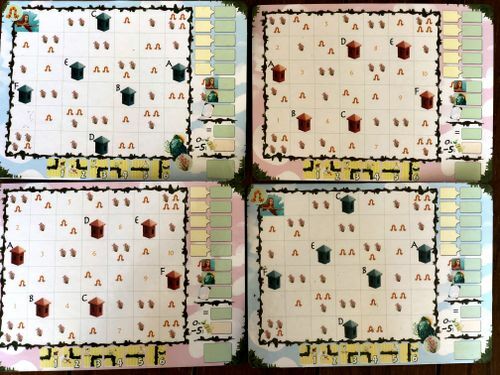 There is also that pleasant feeling of one-upsmanship when you better fit the path pieces into a high scoring round. The heavy emphasis on planning does make this game tricky to play with children. My kids were fixated on extending their existing path, rather than trying to piece together a longer route from path fragments. They would pass over several turns waiting until the path part they wanted came up. Frequently they would want to change their path, re-arranging the parts they already had. Thanks to the dry erase boards and markers, this is actually fairly easy to do. I also appreciated resetting the score to 0 after a low scoring round. While the 0 score is frustrating in the moment, it does guarantee a few points the next round. It was fairly easy to keep my children focused on the upside of that next round scoring. Whether it was a poor draw of the card or poor planning, resetting the score makes it easier for players to recover. I haven't played Avenue, the game Kokoro is based on, so I can't provide a comparison. My understanding is that Kokoro adds decrees — cards that change the rules and objectives slightly. I wouldn't recommend using these decree cards with young or new players. There is already enough going on in Kokoro to be challenging for these players. Adults and experienced players should definitely add the decree cards. They add challenging twists that keep the game play fresh and interesting. Overall Kokoro is a keeper. I enjoyed the cerebral challenge of planning an optimal route while counting the path cards as they are revealed. My children found the game challenging but not overly frustrating — especially when I let them modify their path slightly! Adding the decree cards provides extra variety and challenge. I enjoy the game, it's "light" enough that my family can play, and as you say - has enough depth to be engaging for gamers. However, I am incredibly frustrated with the rule book. It leaves out at least two very fundamental rules that have a tremendous impact on play. First, that you can "connect" through sanctuaries and thus have very long paths. And that sanctuaries "end" your path. Second, that you can pass as often as you want. I'd have made the rule that one of your two actions is to pass (and look at the next sanctuary card if you like), rather than look at the next sanctuary card and pass. Since you already know the next sanctuary after one pass it would imply that you can only take this action once. These two rules are crucial to playing the game and it irks me that they're not better addressed. edited - I had misunderstood a fairly fundamental rule. Again, this was largely because of the brevity of the rule book and shifting actual rules from text to illustration. However, I am incredibly frustrated with the rule book. It leaves out at least two very fundamental rules that have a tremendous impact on play. First, that you can "connect" through sanctuaries and thus have very long and even branching paths. It's not explicitly denied, but since you can't cross paths that you draw, it's logical to assume you also can not cross at sanctuaries. And if you do, that sanctuaries "end" your path. Second, that you can pass as often as you want. I'd have made the rule that one of your two actions is to pass (and look at the next sanctuary card if you like), rather than look at the next sanctuary card and pass. Since you already know the next sanctuary after one pass it would imply that you can only take this action once. These two rules are crucial to playing the game and it irks me that they're not addressed.